Adam Kreitman reached out to me randomly 3 years ago via the contact page on my blog and we’ve kept in touch ever since. Adam runs WordsThatClick.com which helps small business owners increase the visibility of their business on the web. What’s cool about Adam is that unlike most larger agencies, Adam focuses a lot of his efforts on small businesses which is directly applicable to the listeners of this podcast. In this episode, Adam will teach us how to run high converting Adwords campaigns for those on a budget. Enjoy! If you enjoy this podcast please leave me a review on iTunes, and enter my podcast contest where I’m giving away free one on one business consultations every single month. For more information, go to www.mywifequitherjob.com/contest. And if you are interested in starting your own online business, be sure to sign up for my free six day mini course where I’ll show you how my wife and I managed to make over 100k in profit in our first year of business. Go to www.mywifequitherjob.com for more information. Now onto the show. Steve: Welcome to the My Wife Quit Her Job podcast. Today I have my friend Adam Kreitman on the show. Now Adam actually reached out to me like three or four years ago just kind of randomly, and I’m really happy that we’ve kept in touch over the years. He runs wordsthatclick.com which helps small business owners increase their visibility of their businesses on the web, and what’s cool about Adam is that unlike most larger agencies, Adam kind of focuses a lot of his efforts on small businesses which is directly applicable to the listeners of this podcast. Now he’s an expert on Ad Words. He used to be a key contributor for the Rise at the top and he is also a regular author on the Crazy Egg Blog. And what’s also cool is that Adam started wordsthatclick.com because of drug testing, and with that interesting fact welcome to the show Adam. How are you doing today? Adam: I’m doing great Steve, thanks for having me here. Steve: Yes give us the quick background story and tell us about this drug thing that you had going on and Words That Click. Adam: Sure. Now before people get the wrong idea I have not nor have ever used drugs. What you are referring to is I was president of a drug testing company here in St. Louis. And we were the distributors for this really– well it’s really cool technology kind of CSI like. It was called drug light and the drug light you can think of it as like a home pregnancy test but for drugs. It was a stick– plastic stick and you would wipe the surface with kind of like a quack kind of swab on the end of this stick. And within five minutes drug light would tell you whether someone who touched that surface had used illegal drugs, and if so what kind. Adam: Yeah. It was an interesting business to be at more or less let’s put it that way. Steve: Cool, so I can imagine a lot of people before that big interview like a lot of bigger companies do drug test these days I guess. Steve: And it was that your main customer base, was it the consumer? Adam: Well we had a couple of markets we are going after. One was the market of parents of teenagers you know who were concerned that their child was involved with drugs. And the other were businesses especially warehouses, companies that had fork lift drivers, truck drivers in place and they were concerned we are using drugs, and this kind of gave them an overall picture of if there was drug use going on, if so where was concentrated within the workforce. Steve: So how does paper click kind of fall into this drug testing company here. Adam: Good question. When you start a business you try to market however you can, and I was doing everything. I still shudder saying this, but I do in cold calling, we are doing direct mail, I was going to networking events, all sorts of things. And I was looking for a way where instead of me having to go out and find people who are interested in this product, I could have them come to me. And I was having networking event and I was talking to a friend of mine and he was telling me about how well his business is going and how the success is– was solely based on this new advertising platform from Google called Ad Words. And I thought well that sounds pretty interesting and we started using Ad Words for the drug testing business, and it was– this business was not a huge success for a whole bunch of reasons. But out of all the marketing that we did Ad Words was the one that we had the most success with. Steve: And were you running all the campaigns? Steve: And then when did you kind of decide to do this for a living? Adam: Well, so I was having success with it and one day we were doing a drug test for this company that hire security guards to you know for buildings. We were doing drug test of the employees like you could swipe somebody’s forehead with this. And we were in this room with this guy and we were explaining how the technology works, and he starts asking questions like well so if I smoked marijuana last week will that show up? And then he started talking about rehab and started getting a little agitated. I was thinking you know what; it’s a lot more fun helping business owners like get more business instead of chasing drug users around. Adam: I made a move. Steve: So how did you get your business off the ground? Adam: I had a friend who run a kind of different sort of networking event here in St. Louis. And he invited me to speak at one of his events. I spoke one night, the next morning somebody who was there called me up and said let’s have lunch and the next week I was running their Ad Words campaign. Steve: Cool. Was this David [inaudible] [00:06:35] by any chance or no? Steve: Okay. So you got your first client and then from there was it just word of mouth from there? Or did you actually use PPC for your own PPC business? Adam: I run a limited PPC campaign and I still do. Adam: And I know it’s paid for so many times over, but most of it– most of my business especially in the early days came from word of mouth. And it came from getting speaking gigs at you know local chamber events and networking events, places like that and also writing, doing a lot of writing for various publications. Steve: Okay. So want you know one of the reasons I wanted to have you on the show is because you are a paper click expert and you’ve used Ad Words for almost a decade now, right? Steve: And so I was hoping that you’ll be able to share some insights with the audience actually from the perspective of a much smaller shop. Steve: So first of all I’m sure you’ve worked with smaller companies and larger companies. What are kind of the characteristics of a smaller business that they are kind of set apart from a larger one and how do you treat them differently when you run their campaigns? Adam: Well when we are talking about a smaller business we are generally talking about a much smaller budget. Adam: And that I would say more than anything else influences our approach to Ad Words. Adam: Infact I would say smaller companies can be very successful with Ad Words and can have big advantages over big companies when it comes to Ad Words, but I will also say that having a small budget impose great challenges to an Ad Words campaign. Steve: Okay. So what are some of the advantages that a smaller business might have, and what would be a typically good budget that you would be comfortable starting out with as a small business? Adam: Well I would say the advantage of a small company is they are just a lot more nimble, a lot more flexible. Adam: When I’m working with big companies there are committees usually. There are committees and well you know you make a suggestion to change the landing page, and well you know we have run that by legal and there is just a lot of red tape and bureaucracy that can affect the efficiency of managing a campaign. Small business owner you can talk to the owner and hey you know this is what is going on, let’s make this change on your website or add this page or things like that and there are some more generally. They are more willing to try different variations of Ad Copies and keywords and things like that. Steve: Okay, it makes sense. Adam: So I enjoy working with small business owners more for that reason. Adam: As far as the budget I you know I say this a bit tongue in cheek, but I tell this to all my clients you know spend as much as will let you sleep at night. Adam: There are certainly advantages to starting with a bigger budget of you know $3, 5000 a month, but for a smaller business that may be a ton of money and I just don’t have it. And if that’s the case let’s say if all you could spend is 500 or 1000 you know is better than nothing. And start with a very small targeted campaign and see if you can get some traction on that, and then just build from there. Steve: Okay. So hypothetically speaking let’s say you just started a brand new E-Commerce store, you have a brick and motor store as well selling a certain type of widget, what would be kind of your first plan of attack with Paper Click? Adam: Well I want to start with the goal of the campaign right, you need to know what you’re trying to achieve. Adam: Are you trying to make the phone ring, if it’s an E-commerce store then you want to get the sale. Some people just want Ad Words for branding purposes. So the goal of the campaign is going to influence the Ad Copy, is going to influence the keywords that you choose to some extent, it could impact the budget. Adam: So understanding that is step one. Once you know what you are trying to achieve if you have a small budget you want to start a very small focused campaign. Don’t go crazy with your keywords and add like 50 or 100 keywords to your campaign to start. Adam: If it’s in E-Commerce store pick a couple of your top selling products, or pick a couple of products that you get the highest margin on. Adam: And start there and you know Ad Words as much as I’d like to say we hit it at the park every time and right off the bag it’s not usually the case. It’s very much a process of optimization, and you are probably not going to make money on day one. Steve: Okay. So let’s talk about– okay so right then what you just said you recommended creating an ad and I assume we are talking about search and not the display network, right? Steve: Okay. And you want to design your Ad that points directly to the product or directly to a landing page that kind of sells the product, or a listing of products in a category? Could you be a little more specific on what you would do? Steve: Assuming the goal is sales of course. Adam: yeah, assuming the goal is sales this is not to avoid giving an answer but I would say test. Adam: Yeah because I could tell you well send it to you know best practices say that you should send it to the product page, but you may find on your site if you take a step back and have a more of a sales landing page to kind of set the stage for the product may be that works better. And it also depends on the keywords you are focusing on. If you have a key word that’s– I don’t know golf balls, there are a lot of options in there. So you are going to take people to a page that shows the Nike and the title list and your other different types of golf balls that you sell, and let people dig down from there. Whereas if the key word is a specific type of Nike golf ball probably you’re going to want to take them directly to that product page because that’s what they are looking for. Steve: So in terms of choosing the keywords, what do you kind of recommend in the beginning when you are first turning out? Do you start with broad phrase, modified broad? What’s your strategy? Adam: When you have a small budget I would actually start out with exact match. Adam: Right. And just I’m assuming– well I know a lot of your listeners are familiar with Ad Words, but for those who may not be as familiar exact match so if your exact match keyword is Nike golf balls, then in order for your Ad to appear someone would have to type Nike golf balls into Google exactly. Steve: Just wanted your thoughts on that. Adam: Yeah, if you try exact match and it’s not getting a lot of traffic before you go to phrase you might try some other close variations of that initial keyword and see if you could get some traction with those. Primarily in the campaigns we run we are using exact match and modified broad match. Adam: There are a lot advantages to using modified broad match over exact match because you know especially for a local business there are all sorts of variations of the keywords people may type in with city names and zip codes and things like that. So if all you have is exact match you may miss out on a lot of those very big keywords. When you start migrating to modified broad match or even praise match, then you need to start paying very close attention to the negative keywords in your campaign. Adam: And negative keywords are keywords that basically tell Google if this word shows up in a search term, do not show my Ads. Steve: Okay. And then how do you kind of manage the initial bids. Are you in the beginning do you try to bid to get in the top echelon so you can get the data faster, or do you just go with Google’s recommended minimum bid when you are first starting out. Adam: I hardly ever go with Google’s recommended bids. Steve: Okay. I just wanted your opinion because it’s usually really high and much higher than you actually need to bid in my experience at least. Adam: Yeah. You know well they are in business to make money, so you just understand that going in. That said I do tend– I do try to bid on the higher end of things because the fact is when you first start an Ad Words campaign you are put in a bit of a sand box until you prove yourself to Google, until your campaigns have a little bit of history behind them you are just not going to get as many impressions. Google is not going to– you are going to pay more for clicks over all. So I tend to go in with higher bids to show Google that I’m serious, and so that I can also as you said you know get some more data by being in those top spots to see how those keywords are performing. Steve: And how long does it take to get out of the sand box and how does it work exactly? Adam: Well, I would say it takes us I’d say two to three months to get a campaign to the place where it’s kind of let’s call it stable. Adam: You know where we feel that we have a pretty good idea of which keywords are working, whether bid prices are going to be what the quality scores are, all those things. Steve: And then can we talk about quality scores and how that works? Adam: Sure, so the Google Ad Words auction is not a straight auction. Just because you bid the most and you obviously don’t know what your competitors are bidding, but whoever bids the most doesn’t necessarily get the top spot in the Ad auction. So Google has this algorithm called Quality Score that really rewards relevancy. So if you can show to Google that your Ads get high click through rates, and they have dozens and dozens of factors that go into Quality Score and they look at the landing page relevancy and all these factors. So at the end of the day if you have a higher quality score for your keywords than your competitor even if they bid higher than you, you can still end up wrecking higher than they do in the auction, and basically the higher the Quality Score the less you pay per click. Steve: Okay. And this is of course doesn’t take into effect until after you’ve kind of come out of the sand box, right? Adam: Well they– Google will assign you Quality Scores immediately. Like as soon as you launch your campaign, but they do that based on kind of the industry but until you get some history behind your Ads and your keywords and things like that your Quality Score in the beginning may be a bit misleading, it may not be where you end up. Steve: Okay because I know that I’ve noticed with some of my search campaigns I always start out spending like almost three expert click and then over time you know it’s the cost per click is almost gone down by you know like 60% over time. Steve: For some of my Ads. Steve: And that’s actually not uncommon. So what’s your take on showing Ads on mobile? Steve: I mean it’s kind of still there, right? It’s kind of still there, right? You can reduce your bids for just mobile devices. Adam: Yeah you can– there are some things you can do through bid adjustments to bid much higher if you have a campaign that you want to target mobile you can bid a lot higher for mobile clicks than for desktops and tablets. And infact what I was going to say is before you can even break desktop and tablet traffic apart you keep those separate, you can’t do that anymore. Infact you don’t even have the ability to do bid adjustments on tablets which I know a lot of people are not happy with because that traffic can behave much differently. But you know as with everything else in Ad Words you kind of have to test the how the mobile traffic performs for you. I have some campaigns for local businesses where mobile performs as good if not better than desktop traffic. Steve: What is the goal of those campaigns? Adam: This is [inaudible] [00:20:37] you get phone calls. Adam: Phone calls or phone fill out. Adam: And then we have others where we just– mobile doesn’t work, just doesn’t produce in our line but does what traffic does. Steve: Okay. And so at that point do you just turn off mobile altogether or? Adam: Generally, we either turn it off altogether or bid way down on it. Steve: Okay, what are some– I know these are going to be kind of broad questions but just from the perspective of a new shop owner, what are some good guidelines to follow when you’re first starting out with your ad words campaign, and I also want you to kind of touch on whether you enable Google search partners when you’re first starting out as well? Adam: Sure. So search partners are search engines like AOL and Ask.com that don’t have their own paper clip program, they’ve just partnered with Google and show Google ads depending on the budget, depending on the scope of the campaign. If it’s a smaller campaign we usually we use search partners ad to start. If it’s a bigger campaign we will usually separate, we will actually create two campaigns basically identical, but one will be focused only on Google search and the other will be– you can’t just focus on search partners you have to do Google search then search partners, but that other campaign will have lower bids by– it depends but maybe say 30% or so lower, and we do that so that we are not over paying for the search partner traffic. Adam: And that actually leads into your other question about kind of just recommendations for getting started. Segmentation is key with an ad words campaign. Different traffic via key words via Google search versus search partners via mobile versus desktop often can behave very differently, and to really optimize a campaign you need to be aware of how that traffic, those different sources of traffic behave. It’s very likely that in an ad words account you have multiple campaigns, and one may just target Google search with some top performing keywords that you have. You may have another one that targets global traffic. You may have another one that targets modified branch key words search partner and even within a campaign and this is really important to understand. Within campaigns you can create ad groups and an ad group is a group of related key words and they share ads. So going back to the example I said before of golf balls; if you have a sporting goods store you just put all your key words into one campaign and you have an ad about come to our sporting goods store, we’re fantastic, that’s not going to be very effective because the person looking for tennis rackets is going to be very different than the person looking for golf balls, is going to be very different that the person looking for baseball gloves. So you want to segment your campaign and have an ad group focusing on golf balls that have ads that speak specifically about golf balls and link to the page on your site about golf balls, and you may even go more niche than that. So you have an ad group for titleless golf balls, and then an ad group for Nike golf balls, really-really segmenting your ad groups and your campaigns overall I can’t emphasize the importance of that enough. Steve: Okay and then do you actually also segment by geographical location? Adam: Yes and again it depends on the campaign, but I will find for campaigns where we have clients that have locations spread out across the country, really if we segment those out by geo-location we tend to get better performance than trying to lump everybody together. Steve: Okay. What are some of your– okay so let’s switch gears a little bit. So just to summarize everything that you said you want to segment out your ad campaigns as finely grained as possible, so that you it’s like an exploratory mission in the beginning until you find out what works and once you find something that works you kind of– once you know that it’s profitable you increase your ad spend for that particular segment. Steve: Is that accurate? Okay. Steve: Perfect and constantly you are adding negative keywords as you mentioned like 15 minutes ago to these campaigns to restrict the amount of traffic that you know is not going to buy anything. Steve: Right, and so you know so we’ve talked a lot about search, search campaigns now can we talk a little bit now about the Google display network? Steve: First of all what is it and what are some of the major differences between contextual versus query based advertising? Adam: So the display network– Google, if you searched around the web you’ve seen the Google ads on websites and it can be like from the New York Times down to somebody’s personal blog, and as a website owner you get a cut of the action. When somebody comes to your website and clicks on that ad Google pays you a percentage, so it’s a way to monetize a website. As an ad words advertiser you have the ability to place ads websites and there are a number of different ways you can do that, we can get into that. Biggest difference between search and display I would say is the mindset of the person you are reaching. Adam: It’s just, it’s a different mindset. Steve: So how do the guidelines change in terms of your ad copy? Adam: There are a few things, number one with the displays you can run image ads, so it’s not just about the copy, it’s about the image that you use. And as far as the ad copy itself you can test out many-many more variations on the display network because there tend to be a lot more impressions out there than there are on search. They’re just a lot more, there’s no shortage of places your ads can be shown on the display network which is good and bad. You can test out a lot more variations of ad copy and you may find and again you have to test, but you may find being a bit more creative, a bit more in your face may work better on display than it does on search. Work clever I would say in your ads. Steve: One thing I’m actually particularly interested in what you have to say here because I personally have not been able to make a profit off of the display network just yet, and primarily because you know going through you know I’ve tried very specific targets and at the same time you know every now and then a website will come up– pretty spammy website, send me a bunch of clicks and then I restrict it, but then you know the next day another spammy website comes up. So what’s your kind of strategy with the display network? Steve: Okay. So first of all you don’t recommend display network if you are just starting out for a small business, right? Adam: No, no definitely not. Stay clear of it, and in fact when you start a new ad words campaign Google is pretty sneaky about these things. The new default I believe is search with display select which they make sound really good like hey you know not only can you reach people on search, but we’re going to go on the display network and find really targeted places where we show your ads and you know we’re on your side, we’re here for you– well not really. If you do display, start with search, learn how ad words works, kind of cut your teeth on search. If you do display, then I would say create a separate campaign you know we talked about segmenting before– excuse me you definitely want to keep your search and display campaigns separate. Adam: Because they are totally different beasts. Steve: Okay. So let’s say you are starting a display campaign for your golf ball store or your golf store, what is kind of your first plan of attack? Adam: Well the first thing I would say when it comes to the display network is I would start with remarketing. Adam: Which is– have you been able to get remarketing working? Steve: Yes remarketing works wonderfully, yes. Adam: So and again for those who may not be familiar with what remarketing is, somebody comes to your website you cookie them and when they leave your site that gives you the ability to show ads to them on other websites that they visit that show Google ads. So it’s the display network, but you’re only showing your ads to people who have visited your website, and if you’re going to do display start there. Adam: With remarketing after that there are– there’s no shortage of ways you can target people with display. You can do it by topics; Google has a list of a few hundred different topics you can target people by. You can do it by interest, so I should say topics is about the content of the web page. So if you pick small business as a topic, the theory anyway is that the pages you are– your ads display on are related to small business. Now I can tell you a story about doing that and having our client’s ad show in a website that was a webcam for a chicken coup in Boston. So again you really have to be careful on this one. Steve: So do you recommend those broad targeting, or do you recommend like targeted placement in the meeting, just physically going out looking for websites and articles that are relevant, what do you recommend? Adam: If the budget is there I like trying the broad targeting like topic targeting or interest targeting to try and find placement because at the end of the day yeah you can search around and see some websites that may work for you, but Google’s algorithm is pretty impressive and for all the junk traffic that it sends your way, you’re also going to find some placements that you probably would not have found otherwise. So we like to– again if the budget’s there and if the client understands that you know this may not work but we’re going to give this a try and see if we can find some placements that are converting, and if we in a broader campaign if we find placements that are converting, then we will put those in a separate campaign where we’re specifically targeting those sites. Steve: Okay. Can you comment on just the contextual nature of the display network versus search? Meaning is it in your best interest to create an ad on the display network that points to products, or is it in your best interest to point it to a page where you kind of grab an email address and then kind of market to them on the back end with an email list, what has worked better in your experience? Adam: Again I would say test you know not to be evasive but it’s going to work differently for different businesses. I have found that you can drive a fair amount of sign ups you know free sign ups from display networks but the traffic quality may not be there. So you know again it really comes down to testing for your specific business. Steve: So let me ask you this, you mentioned search budget of you know 500-1000 minimum, what would be your budget for like a display network since the net needs to be cast out a lot larger? Adam: I would say again it’s as much as you are comfortable with. I would say the same budget range 500-1000 you can– you’re going to get a lot more action for that money. The clicks tend to be cheaper on the display network and they’re a lot more impressions to be had. So you may find as far as actual traffic goes your budget goes further on display. Now again the quality may not be as great but you’re probably going to get a lot more clicks. Steve: Yeah. I mean I had an ad being displayed on some mobile app before I realized I needed to turn that off and I got like 20 clicks in like 30 minutes. Steve: Or something like that but it was all junk traffic, probably some kid playing some game. Adam: Yes yeah you– if you’re running display and especially these broader campaigns you have to be really-really vigilant because as I said you know things may be humming along and the next thing you know you get you know 50 clicks from a chicken coup webcam site in Boston so. Steve: The thing is they don’t even show you where your ads are showing until 48 hours later, right? Adam: Yeah. There is a bit of a lag again. It’s a challenge and you really-really have to stay on top of it if you’re going on display. Steve: Okay. But do you and this is again a really broad question, but do you believe that paper click can be made to work with you know almost all sorts of businesses, e-commerce businesses and still make a profit or would you say there are some businesses where just PPC is it just doesn’t make sense? Adam: I believe there are businesses PPC doesn’t make sense for example when people contact me and they have a very niche B to B business where they are trying to reach a very specific type of person you know maybe it’s HR manager at fortune 500 companies, that’s tough to do with paper click. Adam: Those people I say try LinkedIn ads, try direct mail because hey you know I focus on online advertising but you know good old fashioned direct mail still works. Steve: Okay, it sounds like Facebook might be better for that sort of campaign. Adam: I have seen Facebook campaigns absolutely wipe the floor with ad words as far as lead generation in some cases, so yeah I mean I love ad words I use it every day, but I’m not going to sit here and sell everybody and tell them they all need to be on ad words, and it’s the best and most fantastic advertising platform out there because for different businesses there are other fantastic options out there that may work much better. Steve: Can you just kind of comment on some of the differences you know why you would chose ad words versus Facebook versus some other ad platform like LinkedIn that you mentioned? Adam: Yeah, it depends on who you are trying to reach. You know for if you are a DUI attorney, nobody is on Facebook liking DUI attorneys or saying woohoo you know I’m a drunk driver, target me. So there you are pretty much stuck with ad words. Adam: But if you know– if there is a very specific demographic that you’re going after especially with the power editor that they introduced a year or two ago Facebook can be really-really powerful. Steve: Okay. What is your comment on just kind of the demographic services that Google ad words offers for the display network? Adam: I have no comment on that Steve. I wouldn’t– I don’t use a demographic targeting. Adam: I just I don’t think it is all that accurate. Steve: Okay. So when it comes to demographic stuff go with Facebook is basically what you are saying. Adam: Yeah. In fact if I may add within the last year Google has kind of hidden this on a geo-targeting tab, but there is a way where you can target households based on income with ad words. So you can target like the top 10% of households the budding bottom 50% and I have tried those before on some campaigns, and I just I don’t trust the data. Adam: I don’t see it working very well. Steve: So you didn’t see any difference in conversions when you tried that. Adam: No-no, I mean we so we did this test for a client and I’m going to be careful about how I describe this, but we were selling a service that primarily would be consumed by the top, let’s call them 30% of households by income, and so we started a campaign where we were just targeting that demographic. And then after maybe a month or so of not really getting great results we opened it up and the results were better. Steve: Interesting. Okay. Yeah. I know Google probably knows a lot about all of us, but I would imagine it’s mostly from our searches, right? And any data that they may have from android phones I would guess. Adam: Yeah. Well they have a lot of data, I mean it’s impressive I mean it really is impressive what they know and I’m kind of trashing them a little bit, but it is impressive what they put together and how you can target people and I don’t know whether they’re just not sharing it with us as much as they could, I mean us as advertisers or something else is going on, but the data that they have is phenomenal and you can use it to create success if you know how to use it. Steve: Okay. Hey. Well thanks Adam we’ve already been talking for quite a while and I want to be respectful of your time. If any of my listeners have any questions for you where can they find you? Adam: They can find me at wordsthatclick.com, that’s my main website. If people who are using ad words campaigns are interested I’ve started another site with a couple of my buddies, who are top PPC guys, I think they’re top PPC guys in the world and we started this site PPC Audit Xmen, and the idea behind that site is we’re all pretty well booked, we can maybe handle a couple more actively managed campaigns, but there are a lot of people out there running ad words that just need a second pair of eyes, an expert pair of eyes to look at their campaign. Adam: Give them feedback on how to improve it. So we started the PPC Audit Xmen site to kind of provide that service and get people expert feedback on their campaigns. Steve: Cool, I’ll definitely link that up and then I imagine there’s a contact form on that site as well, right? Steve: Well excellent Adam, thanks a lot for coming on the show, really appreciate it. Adam: You’re welcome thanks for having me Steve, I appreciate it. Steve: I really love Adam, he’s actually someone who I met four years ago and I’m glad that we kept in touch over the years. Now if you look at our online store ad words represents a significant portion of our online store profits today. Don’t listen to random people out there telling you that ad words ads are too expensive for you to make money. If your margins are decent you can likely make ad words ads profitable, you just have to understand how to use the tool. For more information about this episode go to mywifequitherjob.com/episode49, and if you enjoyed this episode please go to iTunes and leave me a review. When you write me a review it not only makes me feel proud, but it helps keep this podcast up in the ranks so other people can get this information, find the show more easily, and get awesome business advice from my guests. It’s also the best way to support the show and please tell your friends because the greatest complement that you can give me is to provide a referral to someone else either in person or to share it on the web. Now as an added incentive I`m always giving away free business consults to one lucky winner every single month. For more information go to mywifequitherjob.com/contest. And if you are interested in starting your own online business be sure to sign up for my free six day mini course. Where I show you how my wife and I manage to make over 100k in profit in our first year of business. Go to www.mywifequitherjob.com for more information and thanks for listening. I got real, actionable value from this episode, not just the hyped inspiration you get from some other podcasts. The moment the conversation started, I fired up my AdWords account and made some tweaks. I’m off to iTunes to sing your praises. Thanks Ade. 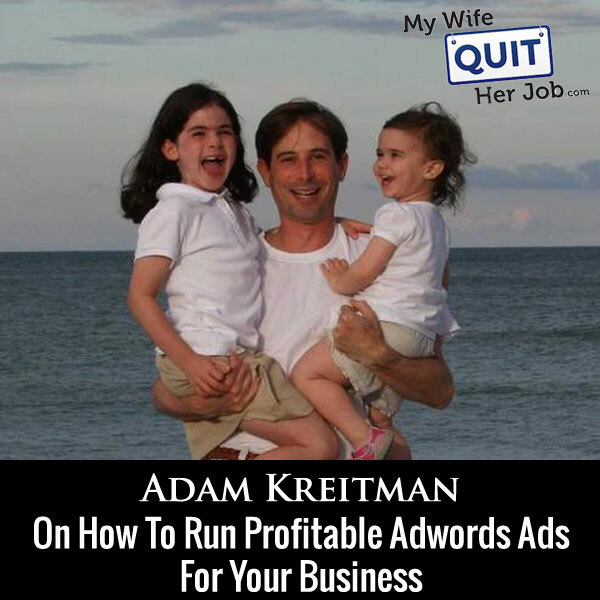 Adam is my go to Adwords guy! Really great detail. I used ad words back in 2007 & 2008 much without success. This episode spread a bunch of light on the ad words topic.